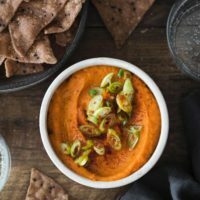 Smoky White Bean Carrot Dip | Naturally.Smoky White Bean Carrot Dip | Naturally. Give the carrots a good scrub and cut into 1” pieces. Steam the carrots until tender and place in a blender or food processor along with the white beans, roasted garlic, lemon juice, smoked paprika, cumin, and the smoked salt. Blend until smooth, adding a splash of bean liquid as needed to help the dip puree. Transfer the dip to a bowl and top with sliced scallions, olive oil, and a sprinkle of smoked paprika. Tips + Tricks: Make this dip ahead of time for a quick day-off appetizer.